Andrew Gillum, who’s already tucked 16 years of political experience into his 39 years, is the Democratic candidate for Florida’s next governor. Along with Stacey Abrams of Georgia and Ben Jealous in Maryland, he’s one of three African Americans vying for a governorship. You wouldn’t think this should be newsworthy in 2018, but it is. As a Florida transplant and inquisitive genealogist, it was all but inevitable that I would explore his heritage. 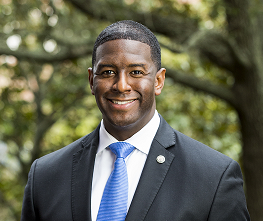 What follows are five things you didn’t know about his roots — a couple of which, I suspect, will be new even to him, including the fact that it was a toss-up whether his name would be Andrew Hardaway or Andrew Gillum. 1) Location-wise, he has roots in Florida, of course, but his father’s side mostly hails from Tennessee and Mississippi, while his mother’s comes from Georgia. Assorted branches meander back in time to Kentucky, North Carolina, and Virginia. 2) Surnames adorning the branches of his family tree include Baker, Cole, Duncan, Gillum, Hardaway, Jackson, Jones, Newsom, Peterson, Rutherford, Shipp, and Tall(e)y. If you share any of these, there’s a chance you could be his cousin — particularly if your family lived in any of the states mentioned above. 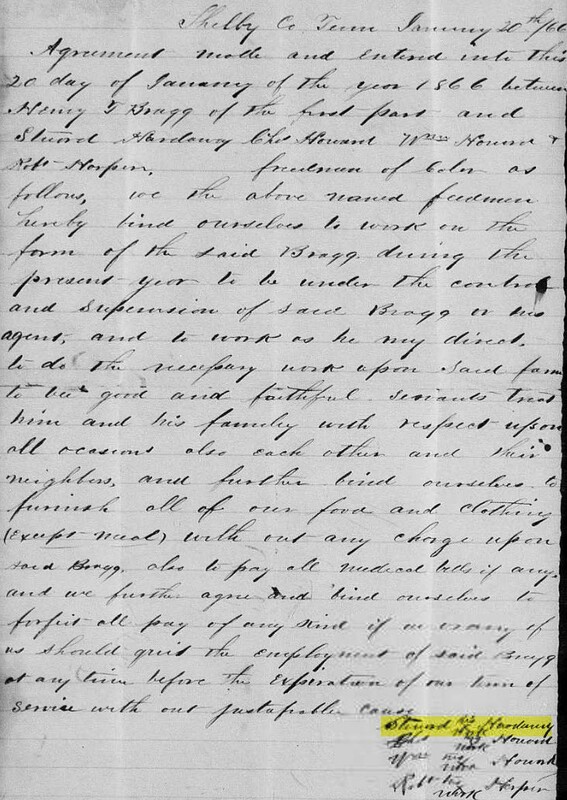 The contract was made with Henry Talbot Bragg, a Confederate veteran, but it would be easy to miss the signature of Gillum’s ancestor — mainly because the name given is “Steward” Hardaway, which leads me to the fourth item. 4) In the decade or so after Emancipation, many formerly enslaved individuals essentially tried on different surnames for size. In the interest of expediency, some assumed the names of those who once claimed them as property. That may be what Stewart Hardaway/Gillum initially did as there was indeed a white Hardaway family of Virginia origin (like Stewart himself) in the Tennessee-Mississippi border area where he resided. Over time many adopted other surnames — perhaps of people they admired, to share a surname with other family members, or for any of a variety of other reasons. And this change was often reflected in 1870 and 1880 census records. In Stewart’s case, the 1866 document above lists him as Hardaway, the 1870 census as Gillum, and the 1880 as Hardaway again. If you examine the family profiles in these last two, you’ll notice the overlap of first names (Stewart, Lucy, Wilkins, and Chaney) and other details. In later years, some of the children recorded here adopted Gillum, while others stayed with Hardaway. Andrew Gillum’s third great-grandfather, Tucker, opted for Gillum by the time of his 1888 marriage. Otherwise, it would have been Andrew Hardaway running for governor. 5) Amanda Cole was born just three years post-Emancipation and lived to the ripe old age of 96 — long enough to see the Civil Rights Act of 1964 enacted. At the time of her passing, she left 187 descendants. Fifteen years later, one of these 187 would have a son named Andrew. Amanda left a stunning legacy, and on November 6th, her descendant Andrew Gillum has the chance to become Amanda’s — and Stewart’s, Tucker’s, Rosa’s, George’s, Angie’s, Peter’s, Cora’s, John’s, and Lucy’s — wildest dream. Please vote.